To change the size, shape, or color of your teeth, veneers are a popular option at Bowen Family Dentistry. A thin piece of porcelain is bonded onto the surface of each tooth to give you a fabulous smile! What is a Veneer? A porcelain veneer is made up of several layers of thin ceramic material, along with an adhesive layer. Porcelain is similar to your tooth’s enamel, so you do not sacrifice the strength of the surface of your teeth to have outstanding cosmetic benefits. The Procedure: In preparation for the placement of veneers, Dr. Bowen will remove a small amount of enamel from the front of each tooth. This makes room for the porcelain veneer to fit perfectly on the tooth while looking natural with your gums and other teeth. After the enamel is removed from each tooth, each veneer is carefully placed to create a beautiful smile. It is bonded to the tooth with a very strong resin cement. The cement is hardened with a special light, making the bond permanent. 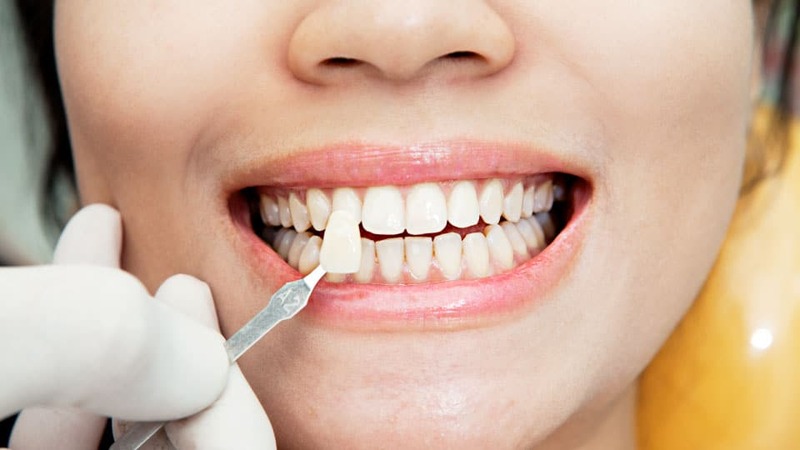 The Results: Veneers cover a multitude of dental imperfections. They can close small gaps, hide stains, cover chips and fractures, and make teeth look straighter. Since veneers are made of porcelain, they are not porous and susceptible to stains like natural enamel. Patients are amazed at how much their smiles are transformed with such a minimally invasive procedure. You will leave with a beautiful smile. To keep your smile radiant and healthy, you will need proper maintenance. Brush and floss regularly and do not miss your 6 month check-ups with Bowen Family Dentistry. It is important to be in good oral health and address any structural problems or decay before undergoing a Manhattan cosmetic dentistry procedures. Make an appointment with Dr. Adam Bowen at Bowen Family Dentistry to see if veneers are a good choice for you. Use our online form to contact us, or call (785) 789-4468 today!